All six City Council District B candidates tackled an array of issues at a candidate forum Tuesday (Sabree Hill/Uptown Messenger). Short term rental issues have been a touchy subject for years in New Orleans, but as local elections draw near, City Council candidates have their own solutions to common rental complaints. All six City Council District B candidates tackled an array of issues at a forum Tuesday, including whether City Council’s short term rental ordinance was too restrictive or not tough enough. Timothy David Ray, educator and musician, noted the rental exemptions granted to the French Quarter which were also chased by residents of the Garden District. Accessory, temporary and commercial short term rentals are prohibited in the Quarter – though some illegal rentals remain – except on a six-block stretch of Bourbon Street. For years, rentals of fewer than 30 days were illegal in most of the city. The City Council approved new short term ordinances last year, allowing rentals for up to 90 days. 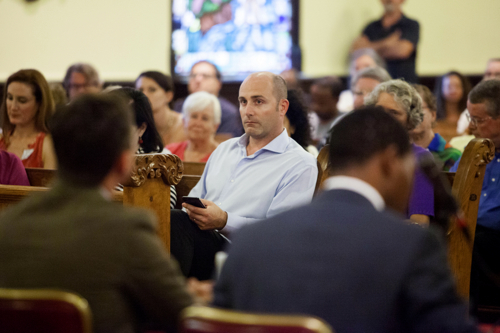 Most candidates said they would rework the short term rental ordinance to suit community needs better, and possibly tie rentals to homestead policies. To read what each candidate had to say, visit our sister site Mid-City Messenger.